One of the world’s largest dredges has arrived in Lyttelton to start deepening, widening and lengthening the port’s shipping channel as it prepares to welcome ever-larger ships. The 230m long dredge, Fairway, travelled from Mumbai, India, with a stop in Singapore for cleaning and anti-fouling. 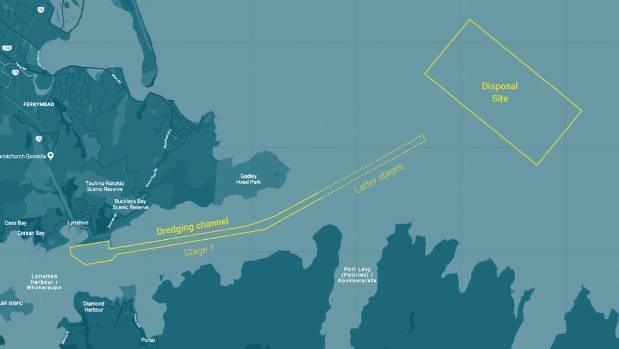 Lyttelton Port Company was granted resource consent in March to dredge the channel. The project was opposed by Ngāi Tahu and surfers group Surfbreak. The company’s chief executive, Peter Davie said the work would enable bigger container ships to call at Lyttelton. 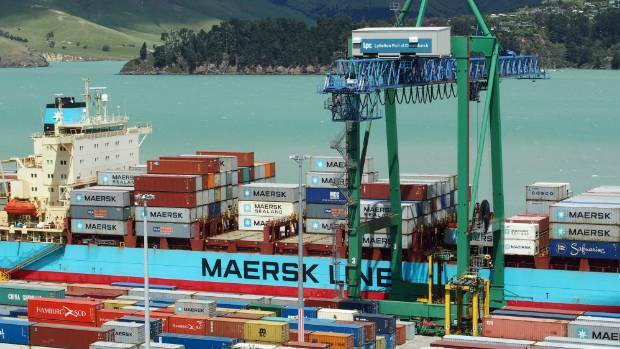 Container vessels had “virtually doubled in size” in the last decade, and the work would trim freight costs for Lyttelton customers by more than 10 per cent, Davie said. A container crane at work at Lyttelton’s container port. Dredging will be done in stages, starting on Wednesday, and will take about 12 weeks to complete. 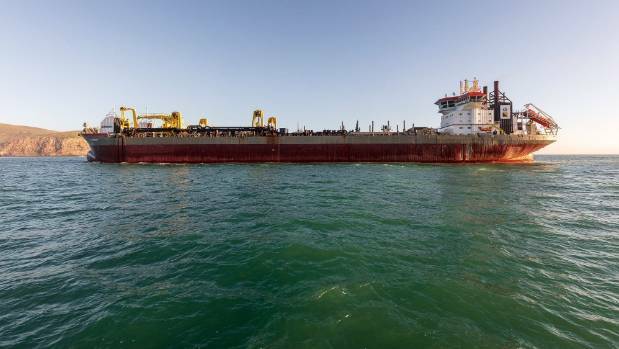 Fairway‘s owners, Netherlands-based contractor Royal Boskalis Westminster NV, will do the work. In the meantime the dredge will be in dock for customs procedures and crew inductions. The port company said the environmental monitoring programme for the project would be the largest ever in New Zealand. The biosecurity plan to allow the dredge to visit New Zealand was developed with input from science organisation the Cawthron Institute. Lyttelton Port environmental advisor Jared Pettersson​ said a plume of silt will be visible coming from the dredge while it was working, but that it would not be environmentally harmful. The Fairway will spend 12 weeks working in Lyttelton Harbour. During the consenting process, Ngāi Tahu lodged environmental and cultural objections as to the local effects of dumping the silt. As part of a mediated settlement, the port company will provide real time data on the project on its Harbour Watch website, and is setting up video monitoring of the surf break at Taylors Mistake as a result its settlement with Surfbreak. The company will also pay Ngāi Tahu $650,000 over 25 years to go towards mahinga kai (food gathering). The trailing suction hopper dredgers collect sand and silt from the seabed. In stage one, the existing shipping channel will be lengthened by 2.5km, widened by 20m and deepened by up to 2m. Dredged sediment will be dumped at a designated spot 5km off Godley Head. The dredgers are equipped with suction pipes ending in drag heads. When a vessel reaches the dredging location it reduces speed and lowers the suction pipes onto the seabed. The drag head moves slowly over the bed collecting the sand like a giant vacuum cleaner. The mixture of sand and water is pumped into the hopper of the dredging vessel. Excess water flows out through overflows and dredging stops when the hopper is full. The sand can be deposited through doors in the bottom of the vessel. The Fairway, 230m long, has come to New Zealand from India. With the 2011 earthquake rebuild behind it, Lyttelton Port Company (LPC) is now focused on enhancing its infrastructure to efficiently manage Canterbury freight volumes, forecast to more than double in the coming three decades. LPC Chief Executive, Peter Davie says, “We have recently been granted resource consent to dredge the harbour shipping channel to increase our draught. This will enable larger ships to call at Lyttelton Port providing Canterbury’s importers and exporters the best possible and most cost effective international shipping solutions. “We have also been granted resource consent to expand our land area to cater for growing Canterbury imports and exports,” says Mr Davie. “What’s critical for us is that these two developments allow us to grow Canterbury’s trade. It is really important that we have the facilities to enable larger ships to move cargo as we continue to grow. Since the earthquakes we have doubled our container volumes and we expect that to continue. “The dredging programme means larger container ships, which have virtually doubled in size during the last 10 years, will be able to call at Lyttelton. It is estimated this will decrease freight costs for Lyttelton customers by more than 10 per cent. “The channel deepening lengthens the navigation channel by approximately 6.5km and widens it by 20 metres. The work will occur in two stages. Stage one will allow vessels with a 13.3 metre draught to call at Lyttelton. Completion of stage two will allow unrestricted sailing for 14.5 metre draught vessels across all tides,” says Peter Davie. Chairman of the International Container Lines Committee (ICLC), which represents most major container carriers calling at New Zealand, Mark Scott welcomes the news that LPC is about to embark on its channel deepening, and undertake further reclamation. Mark Scott says, “It is vital that Lyttelton positions itself well and has the capacity for larger ships to call at the Port. Shipping companies are making decisions now on where these large ships will call in New Zealand and the dredging programme gives them assurance that Lyttelton Port is a major player. Mike Knowles, Chair of the New Zealand Shippers Council says it is really encouraging from a shippers point of view that the Port Company is able to proceed with the dredging and expansion programmes. 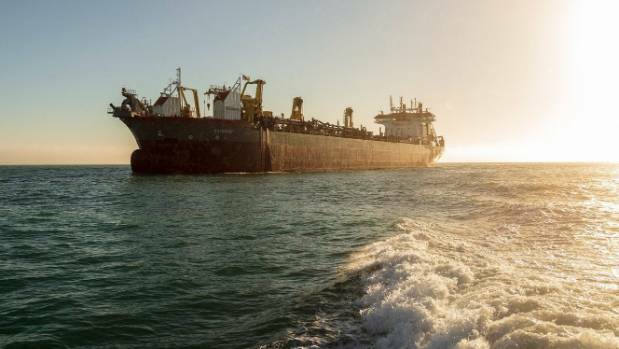 “Bigger ships will continue for the foreseeable future and as Lyttelton is the major port in the South Island it is essential that it gears up to accommodate them. “The infrastructure initiatives taking place at Lyttelton means it will remain competitive for international shipping lines, facilitating Canterbury exporters’ and importers’ access to world markets,” said Mr Knowles. LPC was granted its channel deepening consent in March 2018, with Environment Canterbury satisfied that LPC’s plans balanced what is best for the environment, the community and Canterbury’s growing regional economy. Peter Davie said the overall dredging programme would be the country’s biggest, and that LPC had already implemented the largest environmental monitoring programme ever undertaken for a New Zealand dredging project. “We have awarded the initial stage of the channel deepening programme work to Netherlands-based contractor Royal Boskalis Westminster N.V. – a leading global operator with more than 100 years’ experience. Their dredge will start operating in late July/early August and the dredging programme will last around 11 weeks. “At the same time we will expand our reclamation at Te Awaparahi Bay by 24 hectares, which includes the construction of a new 700 metre container wharf. Last year the existing reclamation at Te Awaparahi Bay reached 10 hectares. “This expansion is critical to enable the Port, as the South Island’s trade gateway, to meet the needs of the forecast growth in the container and general cargo trades. “A key focus of our long term plans is to move our operations to the east, away from the local community. The additional reclamation will facilitate this shift. “We are committed to future proofing our operations by making certain that we have a facility that meets customer needs for the future and supports the lifestyle of all people living in Christchurch, Canterbury and the wider South Island. “We are delighted to achieve these resource consents. We acknowledge the constructive working relationship we have with the many groups that make up our community, particularly iwi, as we carefully carried out our assessment of environmental effects prior to lodging our resource consents,” Mr Davie said. Please view this short video, and see the graphics at the end of this media release, of the future development of the shipping channel and the reclamation. Lyttelton Port has today received a further notice of strike action for 26 April to 29 April by the Rail and Maritime Transport Union (RMTU) for approximately 11 Marine staff. Strike action by this small group will close the Port. LPC will therefore pay none of RMTU’s 191 members for the days – or any other day(s) the Company receives a strike notice for. LPC Chief Executive Peter Davie says the Company has no option but to take this course of action. “What is particularly disruptive about the strike notice served today is that it is for only a very small number of RMTU members – just approximately 11 of its 191 members at the Port. The approximate 11 striking RMTU members operate the launch which delivers our pilots to vessels when they arrive at the head of the harbour and must have pilot guidance to reach our Port. When the RMTU members who operate the launch go on strike, the Pilots can’t reach the vessels so ships cannot get in or out of the Port. That means there is no shipping. The approximate 180 RMTU members not striking know that. They intend to come to work, do nothing and get paid. “This tactic will not work. “I want to make this very clear. The RMTU strike notice may be for only approximately 11 of its members but none of its 191 members will be paid for any day for which we receive a strike notice. “We are taking this step as a direct response to the Union’s tactic of causing maximum disruption to customers and businesses in the region while trying to ensure its members don’t lose money. “The Union has refused our very generous offer which is well above inflation. This offer is well above recent RMTU settlements with other New Zealand Ports. “The dispute is about only one thing – the RMTU wants a better settlement than the other major Union at our Port – the Maritime Union of New Zealand (MUNZ). “The RMTU claims it wants the same offer we made MUNZ – but it has rejected it. The RMTU members want the same salary increases as MUNZ but they will not make the roster changes MUNZ agreed to as part of their offer. “RMTU members have already lost more pay than their negotiators can possibly recover for them – and the longer the Union refuses our offer the more its members will lose. “Meanwhile the Union’s tactics are causing significant disruption to shipping lines, importers, exporters and our region. Striking Lyttelton Port workers have voted on another even longer round of strike action as the industrial dispute deepens. The 200 members of the Rail and Maritime Transport Union are in the midst of a seven day long strike that finishes at midnight on Sunday. They want to be paid the same as the 200 members of a rival union working at the port. The port says it is only willing to do this if they agree to work the same flexible hours the rival union has agreed to. Union spokesperson John Kerr said he was hoping to resume negotiations once members went back to work on Monday. He said if these were not successful then workers would resume striking for three weeks starting 8 April. Meanwhile, National’s workplace relations spokesperson Michael Woodhouse has accused the union of thuggish behaviour. He said Prime Minister Jacinda Ardern should condemn the handing out of pamphlets on the streets where port company directors live. The pamphlets handed out by port workers on Monday included the names and addresses of directors, and information about the strike. Mr Woodhouse says they were designed to get people to approach board members directly and put pressure on them. The workers had been emboldened by the new Labour-led government and should be reminded such bully boy tactics are not acceptable. He says there is no place for personal attacks and abuse in negotiations over pay and conditions. 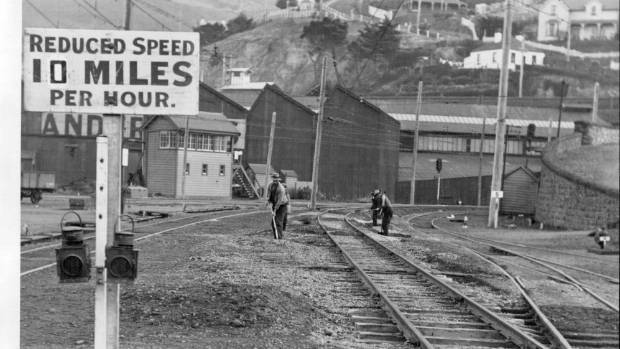 Strikes will begin at midnight tonight at Lyttelton Port by the Rail and Maritime Union (RMTU). The Union is striking for five days (21 to 25 March inclusive). However, we now have certainty there will be no strikes at Lyttelton Port the following week – from Monday March 26 to Monday 2 April, inclusive. The Union must give us fourteen days’ notice of strike action and no such notices have been received for any days in that week. We have made a generous salary increase offer to RMTU members – a workforce which is already well paid. We want to resolve the dispute but we cannot accept the Union’s unreasonable salary increase demands. At the end of this message we have provided LPC’s Media Statement, issued today, which gives further clarity about our position. We appreciate your continuing patience during this difficult time. If you have any questions regarding the industrial action place discuss them with your usual LPC contact. LPC will be unable to berth any vessels during the strike period. This includes Container, Coal, Bulk, Tankers and any vessel requiring pilot and/or tug assistance. The Container Terminal will not be stevedoring any container vessels or coal vessels during the strike period. The Container Terminal and Empty Container Yard (ECY) will be open for Receival and Delivery of cargo between the hours of 0700 and 1500 Monday – Saturday. No services will be available on Sunday. We will be able to continue Reefer Power and Monitoring services at the Terminal. Train capacity between KiwiRail Container Terminal and Lyttelton Container Terminal will be limited to one train per day. Customers should contact KiwiRail to discuss contingencies. We will continue to receive cargo with a valid booking number for vessels scheduled to call at Lyttelton. However shippers should consult directly with their shipping lines to determine what contingency plans are in place for export cargo prior to bringing cargo into the Port. Where port omissions are likely and customers have the ability to hold cargo at their facilities, or at alternate facilities, we would appreciate these options being considered to assist with potential capacity issues at the Port which could result from cargo build up. Due to the fluid nature of this situation we will continue to monitor our approach to receiving export cargo and keep you updated. Neither CityDepot nor MidlandPort will be affected by the strikes. For those customers that use these facilities for full cargo, we are monitoring yard and rail capacity closely and will liaise with you if we start seeing a build-up of cargo. If vessel calls are uncertain, we would ask that cargo is held on site where possible. Train capacity between MidlandPort and LCT will be limited to one train service. Lyttelton Port Company’s offer of parity with the other major Union at the Port has been refused by the Rail and Maritime Transport Union (RMTU) which will begin striking at midnight tonight. RMTU is striking from 21 to 25 March inclusive. LPC’s Operations Manager, Paul Monk, says RMTU does not want parity with the other major Union at the Port, the Maritime Union of New Zealand (MUNZ) – it wants an unfair advantage over it. “RMTU members want the same salary increase their MUNZ colleagues received but without making the roster changes MUNZ accepted a year ago. “RMTU claims there’s a safety issue associated with the new roster agreed to by their MUNZ colleagues. “MUNZ members have had no safety issues since they took it on. MUNZ is fine with it. “The RMTU wants the same money as MUNZ but they don’t want to work the new roster – they don’t want to do equal work. “We want to stop the enormous disruption the RMTU strikes will have on shipping lines, importers and exporters. For this reason, we have dropped our request for them to make any roster changes. We have offered them a salary rise of 3% a year each year for three years, with no changes to their roster or the way they work. “We have made a generous offer to what is a well-paid workforce which already receives well above the average Kiwi’s wage. “That offer is just 1% less than their MUNZ colleagues received. RMTU is hanging out for that extra 1%. They want the extra money without agreeing to the roster changes MUNZ made. This is not parity. “When the strikes begin at midnight tonight our container wharves will be empty. Shipping is the lifeblood of our region’s trade. 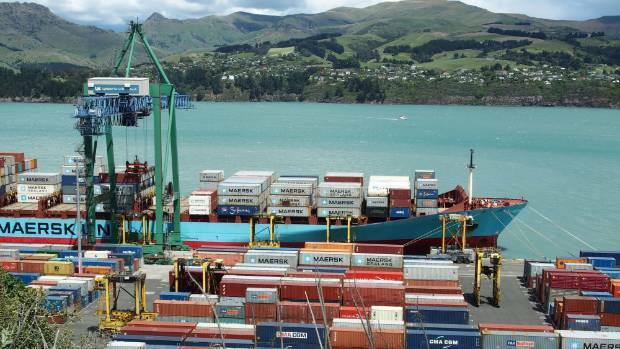 Lyttelton Port manages over half the South Island’s container volume. The RMTU strikes will stop the Port’s heartbeat. This is to advise that the Rail and Transport Union (RMTU) has withdrawn its strike notices for this Thursday and Friday (15 – 16 March) at Lyttelton Port as a gesture of ‘goodwill’ as we try to resolve the current dispute. Unfortunately, due to the late timing of this offer by the Union, there is very little operational activity planned for the Port over these days. We are also very aware of customer feedback that the Union’s previous withdrawal of strike notices came too late to divert most shipping back to our Port. As a result, we have today asked RMTU to extend the withdrawal of its strike notices to Tuesday 20 March. We believe this would genuinely show some goodwill to the exporters and importers of Canterbury and allow for some meaningful shipping to occur. We have offered to pay the RMTU members who will be rostered to work on the days strike notices are withdrawn. In order for shipping lines to make decisions on calling or omitting Lyttelton Port this weekend we have given the RMTU until 3pm this afternoon to advise us whether they will withdraw strike notices for the extended period we have requested (Thursday 15 March to Tuesday 20 March inclusive). While we realise this does not resolve the dispute, and uncertainty would remain beyond 20 March, I am sure you will agree the withdrawal of strike notices from the 15th to 20th March would be a positive development. We have agreed with RMTU’s request for further mediation either Thursday or Friday. With the withdrawal of strike notices for 15 and 16 March, the Terminal will now be open for continuous Receival and Delivery from midnight Thursday 15 March to 2300 Friday 16 March. We will advise further once we have a response from the RMTU. 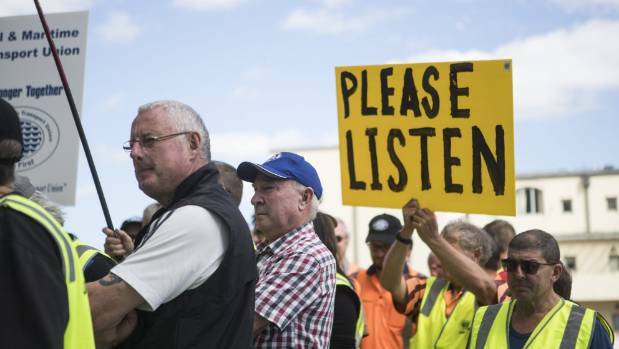 Lyttelton port workers at a protest over wages and rosters outside the Christchurch City Council building last week. More talks between Lyttelton Port and unions have failed to overcome an impasse and a fortnight of strike action will begin from midnight – unless there is a last minute agreement. Rail and Maritime Transport Union organiser John Kerr said the sticking point was the port company’s refusal to pay full wages for about 70 cargo handlers over last Thursday and Friday. LPC Operations Manager Paul Monk said 54 union staff were affected between Thursday and Saturday, “days for which the union gave late notice of withdrawing its strike action”. Work will stop after midnight Monday March 12 unless there is a breakthrough in talks with the Rail and Maritime Transport Union. The union gave notice of strike action for the two days, then withdrew it. The port company said it had to divert ships meaning there was no ship loading work on those days. Kerr claimed a rough estimate of the cost to Lyttelton Port of paying the wages would be about $33,000. Kerr said this meant that for a relatively small sum the port company was prepared to lose much more in revenue, with a knock-on effect to freight companies and Canterbury importers and exporters. Monk said staff who lost work were “in a wide range of roles at the port with varying responsibilities and wages. This makes it challenging to provide an average cost”. “Due to the wide variety of shipping and ancillary services it is also difficult to give the complete range of costs for ship diversions,” Monk said. Kerr said the union put forward two options as a framework for settlement early on Monday. “We’re ready to talk again at any time but there’s an excess of testosterone at the bargaining table. A Lyttelton Port spokeswoman said recent industrial disruption had cost shipping lines and Canterbury freight firms. The Canterbury Employers Chamber of Commerce chief executive Leanne Watson said none of her members reported being affected yet, but they would be if two weeks of strike action took place. The port company said it had to reorganise the arrival of more than eight vessels between Sunday night and Monday. “International shipping does not usually allow for vessel diversion with less than seven days notice. The company reiterated its “generous” offer of a 3 per cent salary increase each year for three years while asking for no changes in their conditions of work. “This means we are no longer asking them to make the roster changes, agreed to a year ago by their Maritime Union of New Zealand colleagues, which would allow us to offer customers more flexible servicing of their vessels. “Because of Maritime Union members’ flexibility in accepting the new roster they received a salary increase of 4 per cent this year and 3 per cent for the next two years. “Rail and Maritime Transport Union want the same salary increases as their Maritime Union colleagues while refusing to make the same roster changes,” the port company said. 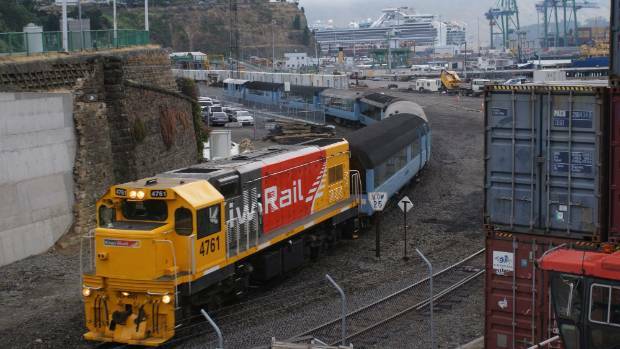 Lyttelton Port of Christchurch (LPC) has heard that the Rail and Maritime Transport Union of New Zealand (RMTU) are planning industrial action. LPC Chief Executive Peter Davie says the Company has made LPC RMTU members a very generous offer while asking them to accept small changes most of which have already been embraced by their MUNZ colleagues at the Port. “We are offering annual salary increases of at least 3%. That is almost double the current rate of inflation (1.6%). They are asking for salary increases up to 15.45% for some of their members. These jobs in the Port are all well paid. “We are a fair and reasonable employer but such salary demands by RMTU are unreasonable. These demands come on top of the substantial salary increases we have given their members over the last three years. The 187 employees who make up 40% of the LPC Container Terminal staff covered by these negotiations received total wage increases of 7.5% during that time. “We concluded negotiations in 2017 with the other major Union at our Port, theMaritime Union of New Zealand (MUNZ), which 60% of our Container Terminal staff belong to. We agreed with MUNZ more efficient roster alignment in the Container Terminal to support our operations and growing customer needs. We are keen to see these arrangements also adopted by the RMTU so we can continue to improve customer services and remain competitive with other New Zealand ports. “With our ongoing volume growth there is the need for better mechanical maintenance coverage. We have agreed with the RMTU a roster for these staff which we both find acceptable but we reject their unrealistic wage demand. 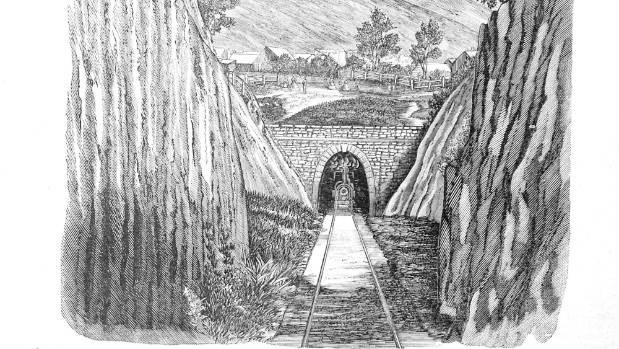 Lyttelton Rail Tunnel, seen here in the old Illustrated Press, opened in 1867 to join Christchurch and the port. Imagine arriving fresh to New Zealand at Lyttelton and disembarking from a ship with all your worldly belongings, ready to start a new life in a blossoming little town called Christchurch. You’ve travelled for months to get to your new home, but this final stage throws up one of the trickiest parts of the journey – a long, arduous scramble over the steep Bridle Path of the Port Hills or a perilous journey by small boat across the Sumner bar to Ferrymead. The idea would be enough to put anyone off. 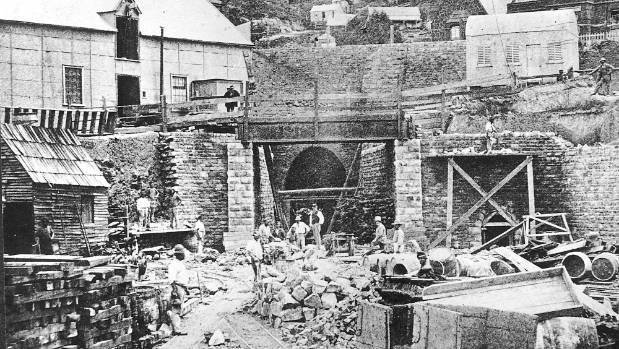 The tunnel under construction, with provincial engineer, Edward Dobson in his distinctive white top hat, to the right of the tunnel entrance. But while the hills were an inconvenience for travellers, for businessmen desperate to export Canterbury’s goods to the rest of the world they were a major hindrance with the potential to cripple the market. The region’s early settlers realised this, and almost as soon as they’d poured off the Four Ships there were murmurs of building a tunnel through the hills. 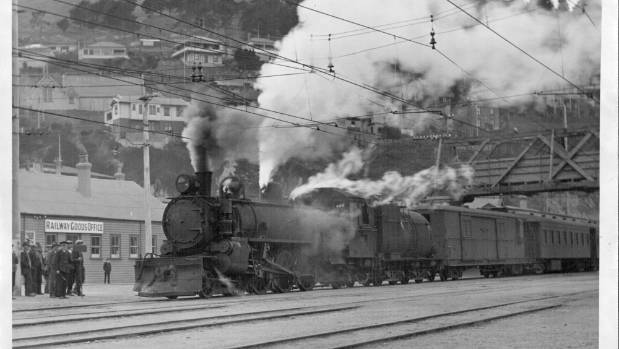 Steam engines replaced the electric locomotives on the Lyttelton line during repairs to the overhead equipment at Woolston in August 1932. The idea was mooted in the early 1850s, but political wrangling proved a stumbling block as conservative colonists condemned it as financially reckless and an unnecessary extravagance. Chief among the opposers was James FitzGerald, a former superintendent of Canterbury province who dismissed it as ill thought-out and unaffordable. But his successor William Moorhouse, elected in 1857, was a great advocate. Heavy rails on the curve at the entrance to the Lyttelton tunnel were replaced with new ones in 1933 after the weight and speed of electric locomotives caused considerable wear. “Railway Billy” asked the council to “consider and determine the best method of securing safe and expeditious transit of our marketable productions to the place of export”, and in October 1858 a decision was made to built New Zealand’s first railway tunnel and the first in the world to pass through the side of an extinct volcano. Work began in 1860 but the British contractors demanded more money and gave up when they hit rock. Undeterred, Moorhouse sailed to Melbourne and recruited new contractors. 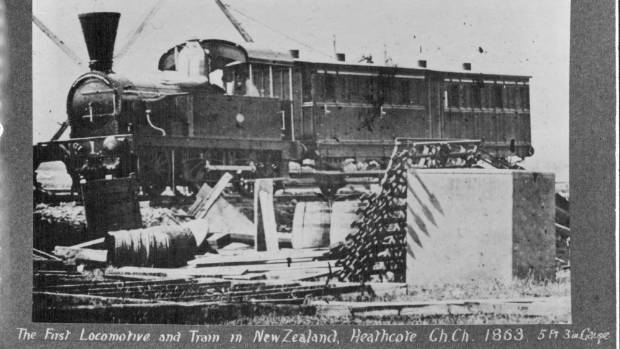 The first locomotive and train in New Zealand, at Heathcote in 1863. The actual building work fell to Edward Dobson, Canterbury’s provincial engineer, who opened up access cuttings at each end of the tunnel. Educated at university in London, he had studied the new Belgian railway system and brought his knowledge to New Zealand. David Welch, an historian who has written a book about the tunnel, Port To Plains, said Dobson’s brilliance was key to its success. 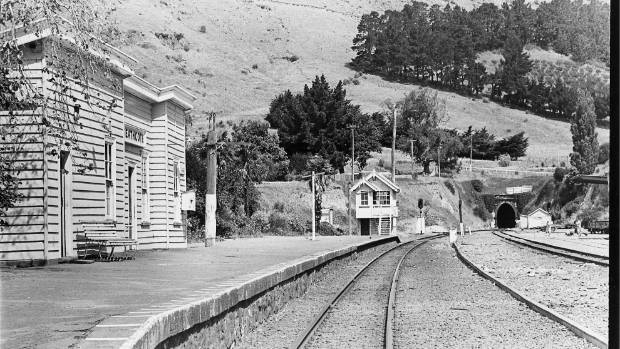 Heathcote Valley rail station, signal box and the rail tunnel to Lyttelton, January 1981. “To me, he is the real hero of it all,” he said. “We were very lucky to get such a multi-faceted engineer. He was hugely influential. Work was arduous to say the least, with progress at a painstaking three metres a week. Lyttelton railway tunnel is just as important today as it was 150 years ago, with over a million tonnes of coal being freighted through every year. Miners attacked the face with pick and shovel, using gunpowder to bring down rock that was then carried away by horse-drawn wagon. More rock had to be excavated than was expected, the tunnel was incredibly stuffy and ventilation shafts had to be put in to allow workers to breathe. It was also very wet – so bad that in one stretch a cover had to be built to protect miners. Despite the conditions there were few injuries, with just two deaths during an explosion. Eventually, on May 24, 1867, the two holes being bored from each side met and an iron rod was passed through. A few weeks later the public were able to walk the entire length of the tunnel. The Lyttelton tunnel was officially opened for passengers on December 9, the journey taking seven minutes – a far cry from the struggle over the Bridle Path. But the tunnel wasn’t quite finished – workers still had to shape the inside, finally completing it in 1874. It eventually contained 1.5 million bricks and cost 195,000 pounds to build. KiwiRail engineer Trent Ludlow said it was a “massive achievement”, given its complexity. The tunnel was crucial for Christchurch and the success of the Lyttelton port, carrying both goods and passengers between the two. And its role has changed little in 150 years, trains carrying 1.1 million tonnes of coal, 300,000 tonnes of logs and up to 80,000 containers through the tunnel every year. “For us it is a vital link for us, so good-on the forefathers for having that vision,” Peter Davie, the port company’s chief executive said. “As the rail tunnel was established it allowed Lyttelton to develop as a deep-water port. That was the primary issue – we didn’t have a deep-water port in Canterbury. Today, up to nine trains a day travel through the tunnel, all now carrying freight after the 2010 and 2011 earthquakes.